U.S. public debt is now bumping up against the debt ceiling. 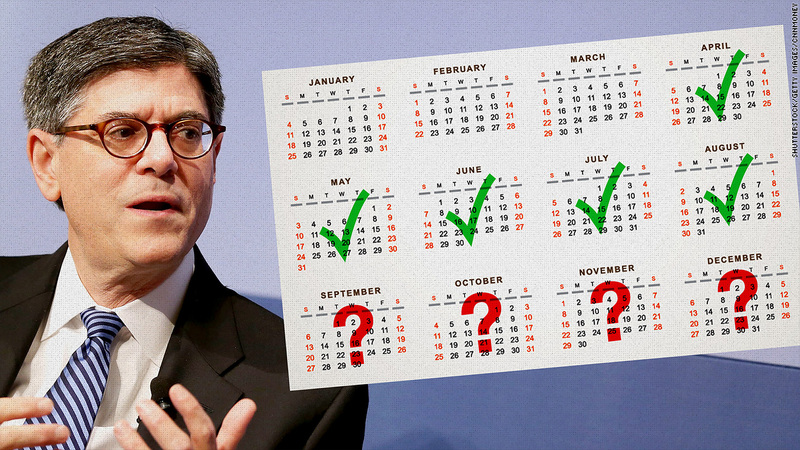 Treasury Secretary Jack Lew's moves will buy lawmakers some time before they must act. The question is: How much? The suspense -- or rather, the suspension -- is over. The U.S. debt ceiling has been reset at $18.113 trillion, the Treasury Department said Tuesday. That new limit on public debt is about $1 trillion above where it stood in February 2014, when lawmakers decided to "suspend" the ceiling through this past weekend. That cool trillion reflects how much the Treasury Department has borrowed during the suspension to pay the country's bills. For lawmakers, a debt ceiling suspension is like a game of pretend. As in "We don't want to publicly vote for an actual increase to cover all the spending we've already approved. So let's pretend the debt ceiling doesn't exist for awhile." The game isn't quite over yet, either. Yes, the suspension has ended and the country's outstanding debt is now at its limit. But Treasury still needs to borrow. So Treasury Secretary Jack Lew has begun using a bunch of legal accounting moves that will let him continue paying the country's bills in full and on time without breaching the new $18.113 trillion debt ceiling and risking a U.S. default. Still, it's not clear just how much time Treasury's maneuvers can buy before lawmakers must either man-up and vote for an increase or chicken out and approve yet another months-long suspension. Treasury hasn't made any estimates yet, because it's still hard to predict how much it will have to pay out in tax refunds and how much it will receive in tax payments by April 15. The Bipartisan Policy Center, however, has an excellent track record in making estimates of when the debt ceiling must be raised. Its latest forecast: Sometime between October and December. Since it's been tough for Republicans -- who now run Congress -- to find consensus among themselves on fiscal issues, let alone with Democrats, political observers think the fight over the debt ceiling could be a tough one this fall.